One scholar will have you know that contrary to received wisdom, Charlotte Brontë almost certainly did NOT underdress for a dinner party thrown by her hero, William Thackeray. The Guardian reports on this latest development in Brontë scholarship. Brontë greatly admired the author of Vanity Fair and dedicated Jane Eyre to the man. 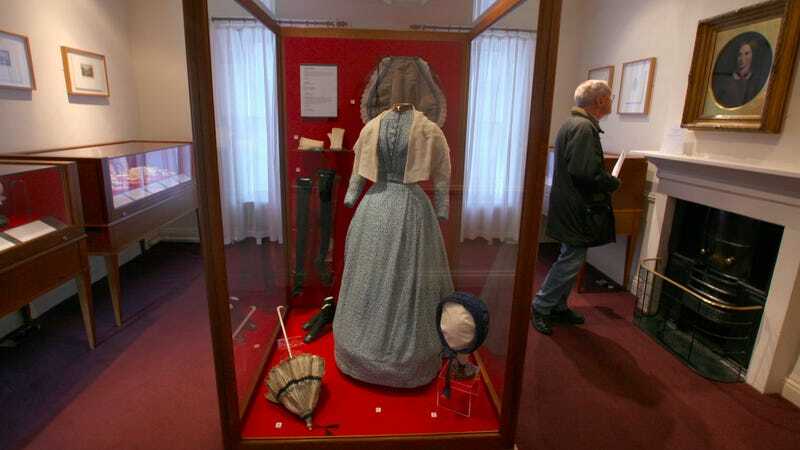 When she came to London 1850, he held a dinner party in her honor in his home, and the Brontë Parsonage Museum has a dress long thought to be what she wore that night. There’s just one problem: If Charlotte Brontë wore this particular number—a pretty but simple day dress—then she was woefully, embarrassingly underdressed for a formal dinner party with London artistic types held during the evening. It’s that damned Blanche Ingram and her friends all over again! Well, in a paper newly published in the journal Costume, historian Eleanor Houghton argues that no way would Brontë have made this particular social misstep. Not because the author was, contrary to your mental image, a dedicated fashion plate with a closet full of silks; but rather because she’d committed this particular sartorial sin once already and she wouldn’t have done it a second time. Unfortunately, even if Brontë was dressed to match the crowd, the party was still a complete disaster.